Runners, assemble! Hong Kong Disneyland Resort’s (HKDL) super-charged race event, the Marvel 10K Weekend 2017 – Presented by AIA Vitality, is the perfect chance to showcase athleticism out on the course! This race is making a return following last year’s inaugural event in which close to 9,000 athletes and families enrolled. The sequel features even more Disney magic combined with the joy of exercise as Marvel Super Heroes are set to make heroic appearances! HKDL is proud to announce that the Marvel 10K Weekend will be held on September 16 and 17. The event continues the excitement of the park’s latest Marvel-themed attraction, Iron Man Experience, and the current Marvel Super Hero Summer event. Marvel Super Heroes will show up to cheer for runners, making it a one-of-a-kind Disney race experience! Registration will begin today and last until July 31. Runners are urged to register now on the event’s dedicated website. Guests are encouraged to join the event with friends and family dressed as their favorite Super Heroes, and the three best dressed runners will win a prize. Captain America, Spider-Man, Thor and other Marvel Super Heroes will cheer for the runners at the starting and finishing line in the event. The Marvel 10K Weekend is an unparalleled opportunity to enjoy a challenging, inspirational run, and will also showcase the gorgeous scenery, views and the one million beautiful trees and plants all across HKDL. Four races will be held this year. Guests can join the Captain America 10K to test their strength and endurance, or join the Thor 5K. The Spider-Man 3K is just the right distance for the whole family. Finally, young Super Heroes can show their early potential while having lots of fun in the Kids Races. 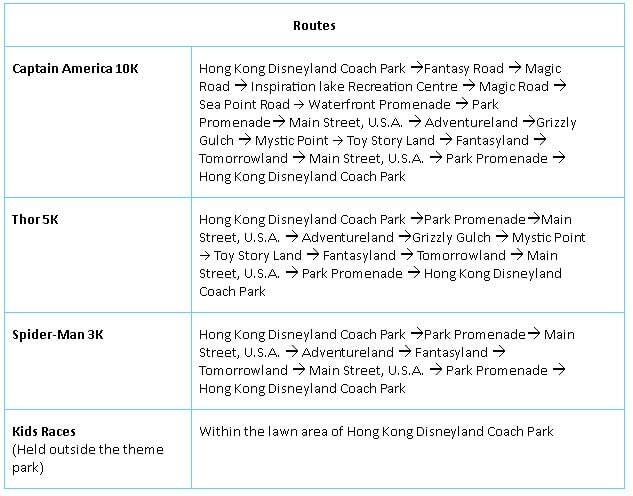 The Captain America 10K and the Thor 5k will take runners through the seven themed lands of the park, running through Main Street, U.S.A., Fantasyland, Tomorrowland; Adventureland; Toy Story Land; Grizzly Gulch and Mystic Point. Runners can take memorable photos with Disney Friends. Participation fees for the events range from HK$250 to HK$500. Runners will be awarded a unique Super Hero medal when passing the finish line to commend their achievements. Each registered runner will also collect a unique Marvel Runner Pack containing an event T-shirt, race bib and other useful items. The Hong Kong Amateur Athletic Association continues to be the co-organizer for this year’s Marvel 10K Weekend 2017 – Presented by AIA Vitality. Wonderful prizes await runners of the Captain America 10K as well! Runners will be separated into four age categories: aged 16 to 19, aged 20 to 34, aged 35 to 44 and aged 45 or above, and the top three runners in each category will be awarded a night’s stay at one of the resort hotels or a dinner buffet, as well as designated “Marvel” Collection Captain America accessories presented by Chow Tai Fook, the event’s Official Gold Jeweler.